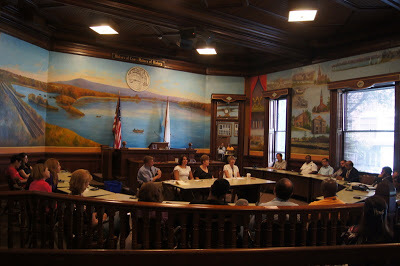 HOLYOKE – If Holyoke is to be a center of computing technology, some city councilors say it makes sense for councilors to be accessible in a city-sanctioned e-mail system. But other councilors say they would avoid using a city system because such correspondence is subject to public-disclosure laws, which could discourage constituents who want to discuss something in confidence. The City Council on Jan. 5 referred the e-mail proposal to the Public Service Committee. Councilors also will seek an opinion from the Law Department. They want advice about disclosure requirements of municipal e-mail systems and issues related to the Open Meeting Law if multiple councilors happen to exchange e-mails on an issue, said Councilor Rebecca Lisi, who filed the e-mail proposal. “I think that constituents really want to be able to have that quick communication,” Lisi said on Tuesday. The discussion comes as a regional task force has been discussing the potential benefits of an $80 million high performance computing center. A partnership consisting of the state, colleges and private companies plans to build the center along the canals in a project supporters say could make Holyoke a research hub. Councilor Aaron Vega said it is important that people looking through the city Web site have access to councilors by e-mail. A councilor can always tell someone who wants to discuss a private matter that they can speak by phone, he said. “Keep in mind if we are to (be) home to (a) high speed computer center and to an innovation district I believe we need to embrace new technologies and ideas that move us forward,” Vega wrote in an e-mail. The Holyoke Gas and Electric Department operates the city’s Web site and e-mail services for department heads and others. Adding e-mail accounts for city councilors would be a minor adjustment, department Manager James M. Lavelle said. Councilor Kevin A. Jourdain has a Web site and e-mail access, but it is a private account. He wants the public to feel free to contact him without worrying the discussion might have to be made public because it occurred on a municipal e-mail system, he said. “This way, if a citizen e-mails me, if they want that confidence, they have that knowledge that they will have that confidence,” Jourdain said. Courts have debated the disclosure requirements that public officials face regarding use of e-mail and other electronic communication. For example, according to Reuters news service, the U.S. Supreme Court said last month that it would decide in its current term whether privacy rights covered a worker’s personal text message on employer-owned equipment, hearing a case about an Ontario, Calif. police officer who sent sexually explicit messages from his department-issued pager. Meanwhile, in West Virginia, the state Supreme Court ruled in November that private e-mail communication to and from government employees don’t qualify as a public record. The Associated Press had sued to gain access to the correspondence. John P. O’Neill, who is the Ward 7 councilor here and a lawyer, said he believes city business that a councilor discusses in any forum should be subject to public disclosure. “In other words, if we’re conducting public business on our private computers, I don’t think we can get around the Freedom of Information Act,” O’Neill said. ***Councilor Vega and I filed this order at this year’s first city council meeting. We will work to keep you informed about how the issues progresses through committee.